How You Eating Your Bacon? In a terrible shameful way: A bag of T.G.I. 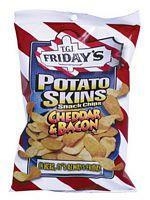 Friday's Potato Skins Snack Chips; Cheddar & Bacon flavor. I was going to go for the Butterfinger Crisp, but I'm sporting a gruesome hangover, and the precious fats and oils in these chips were calling to me. And these chips have that in spades: Oil is the #1 ingredient in these chips, not potatoes - or "dehydrated potatoes - which come in at number 2 - but oil - corn, soybean, and or cottonseed. Bacon, or anything remotely bacon-like, is nowhere to be found here. So in a way, that's good - that means it doesn't count toward my recommended daily allowance of bacon. And they're gone now anyway, safely esconsed in my gullet where, like the bag promises: "In here, it's always Friday." I'm predicting that it'll be a Friday when they nuke the port in Long Beach as well. Boy, TGI Friday's sure will hate that.